Kim Clijsters made a successful return from a serious wrist injury with a 6-2 6-3 win over Croatia's Jelena Kostanic in the Antwerp Open first round. 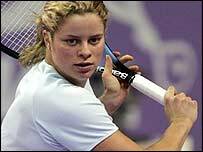 Defending champion Clijsters, 21, last played in early October when she retired in the second set of a match against Russia's Elena Bovina. But the Belgian produced superb form and moved freely as she sealed victory over Kostanic in just over an hour. Clijsters dominated her 35th-ranked opponent from the baseline. The Belgian broke Kostanic in the first and fifth games before taking the opening set in 30 minutes. She broke the Croatian's serve again in the third game of the second set before wrapping up the match when Kostanic sent a forehand long on the first match point. "I wanted to play again so badly and I am really surprised everything went so well," Clijsters said afterwards. "Physically, I was 100% and I did not have to hold back at all out there. My backhand is not yet technically perfect but it is getting better and better." In other first-round matches in Antwerp on Tuesday, Nathalie Dechy of France and Croatia's Karolina Sprem suffered surprise defeats. Dechy, the world number 13 and semi-finalist in last month's Australian Open, lost 7-6 6-4 to Czech Klara Koukalova. World number 17 Sprem was beaten 7-5 6-3 by Russian qualifier Anna Chakvetadze who won the first five games of the match. Camille Pin of France beat Spain's Marta Marrero 6-1 6-2, and Katarina Srebotnik of Slovenia defeated Italian Maria Elena Camerin 3-6 6-2 6-4.